It’s a Monday and the Wildwood, as always, has a message for us. It comes to us in the shape of the Knight of Vessels, represented in this deck by the slick Eel. But what does the Eel represent to you? For me, I see him as slippery and rather a negative character. He’s the romantic cad that’ll leave you just when you need him the most. But he must have a positive side, mustn’t he? Time to pick up and read the book…. The eel, according to the book, has purity of intent. I’m thinking here, someone wearing their heart on their sleeve. 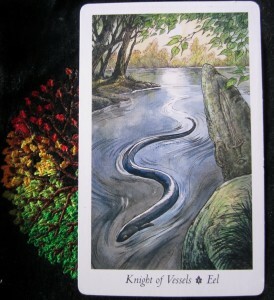 The book also says that the eel is able to bring wisdom and maturity to the tasks that need undertaking today. Good, I’m going to need a darned good dose of that today! The book says that embarking on a quest of personal revelation, your vision leads you onwards. My vision? If it means my battle plan for the day, yes, I have one. If it means my life / mission statement, that’s a little beyond a card of the day post, but I get what it’s aiming for. For once! It also says that my deep feelings are expressed at every turn. Goddess I hope not! So, what have we got for today? Possible attraction, conquests, seduction? There’s also agreements, induction, a possible union, people coming together. Let me know how your day goes with this fellow floating around. I’ll share my insights later on. Blessings to you this day and if you’d like my help, you can book your slot with me here.